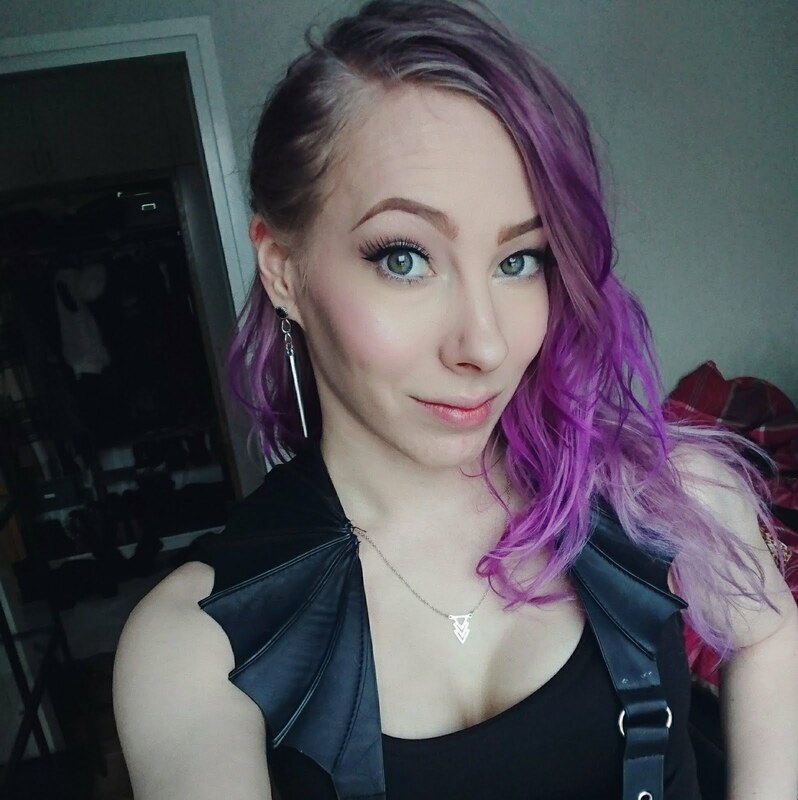 How are you all this Tuesday? It feels like such a long time since I last posted, though I don't suppose it is that long break. Oh well. 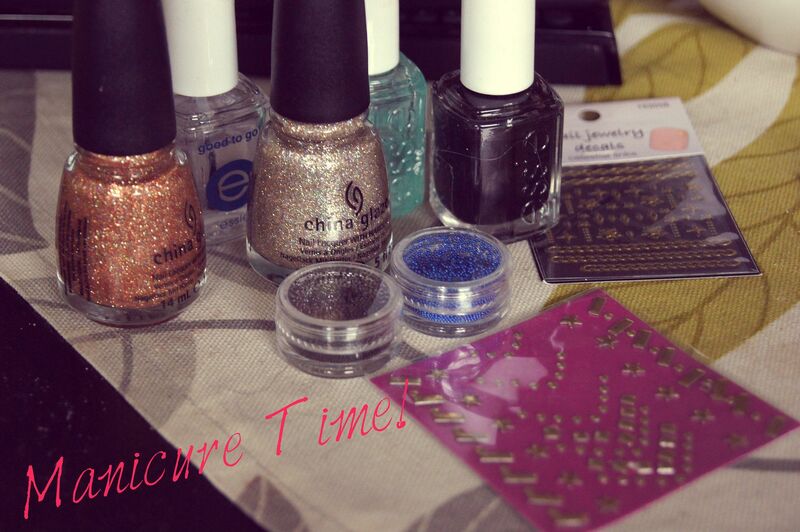 You need two nail polishes, nail stickers, micro beads, base coat and a top coat. (I have extra stuff here because I wasn't sure what I wanted to create at first.) Note: Remember to let the polish dry after each step! Start off with base coat. 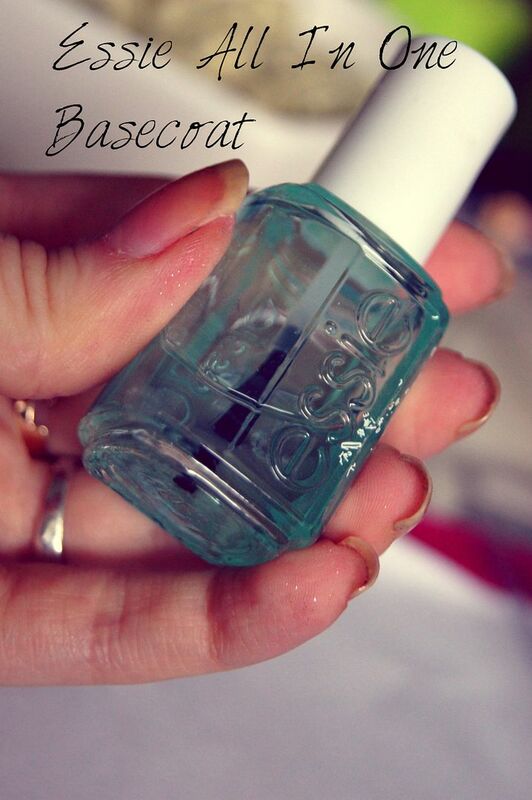 I use Essie All In One, but use whatever you prefer. Start the painting with the black polish. 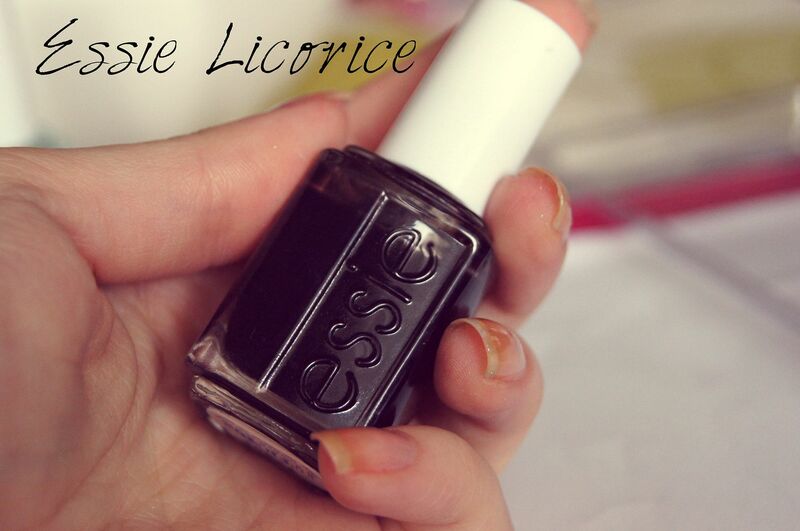 My personal go-to black is Essie Licorice (or Liquorice, however you want to spell it). 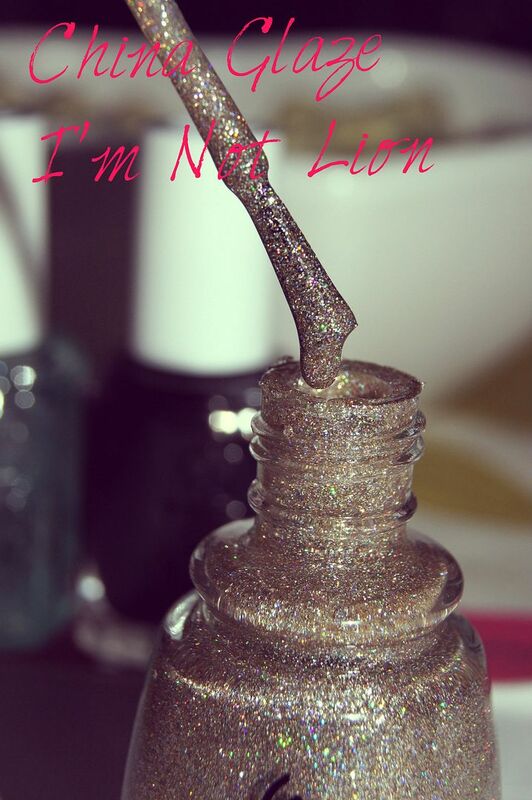 Take out your gold polish - my choice was China Glaze I'm Not Lion, which is super gorgeous glitter polish with fine glitter and perfect coverage with just two-three layers. Paint the remaining one and half nails with the gold polish. Now that you're base is done, you can start decorating your nails. I started by adding a piece of chain sticker along the diagonal line of the middle fingers. Next step would be adding the caviar to the ring fingers. 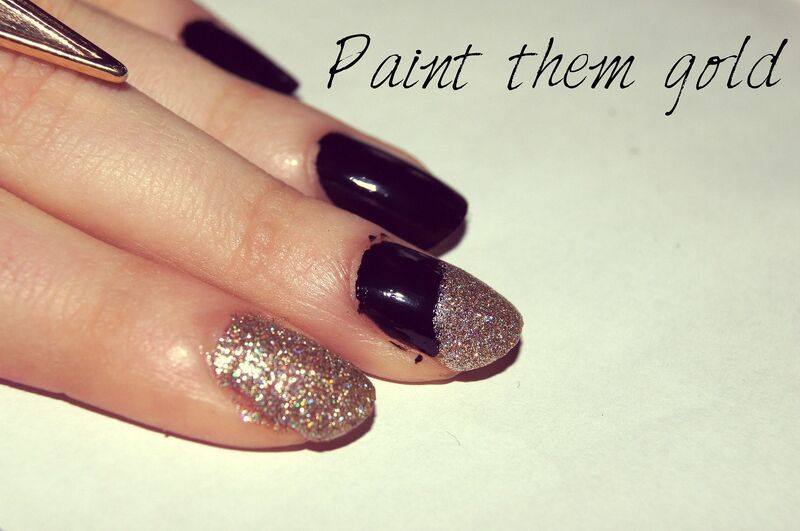 Add another layer of black polish, and before it's dry, sprinkle black micro beads on the finger. Press down the beads gently to get them to attach better. 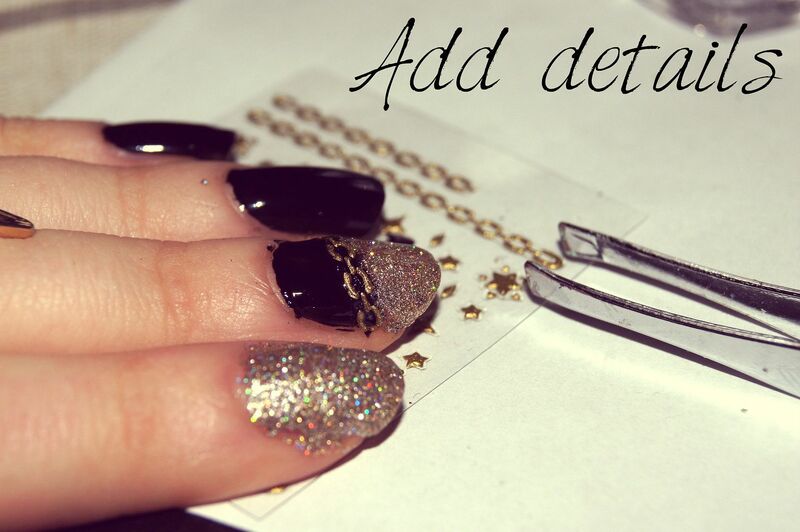 Create a cross with round sticker studs on the pinky. 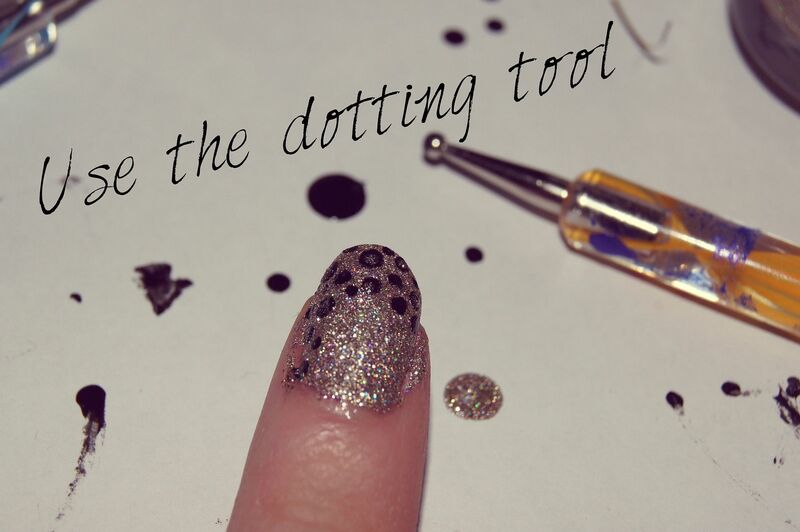 Use the dotting tool to create black dots of different sizes on your index fingers. 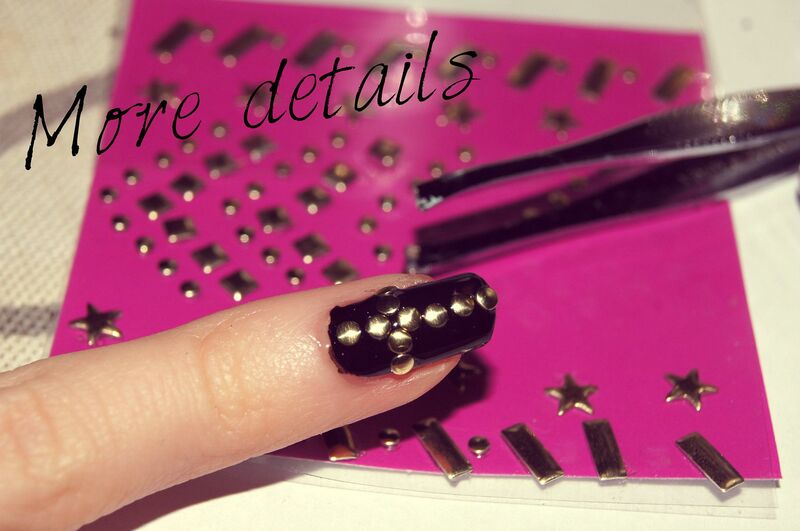 Then use smaller dotting tool to add gold dots on top of some of the black dots. 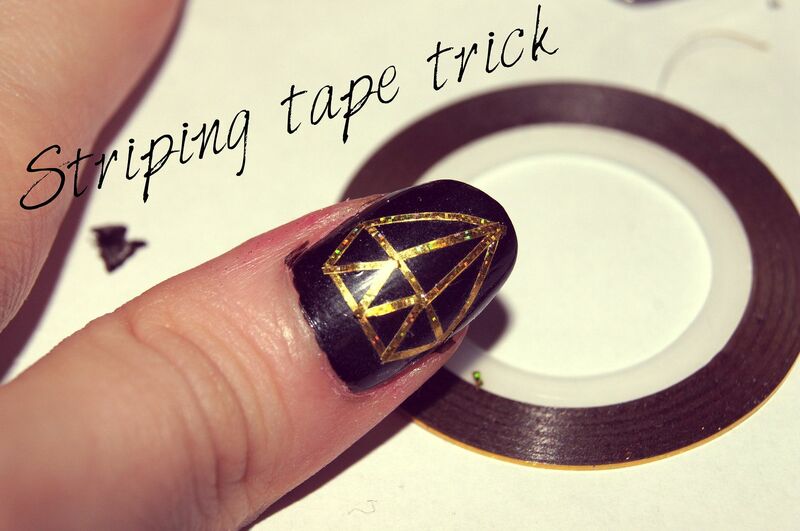 Next, create a diamond shape on your thumb with striping tape. I was on the fence whether to leave it like this or continue, but this time decided to continue. 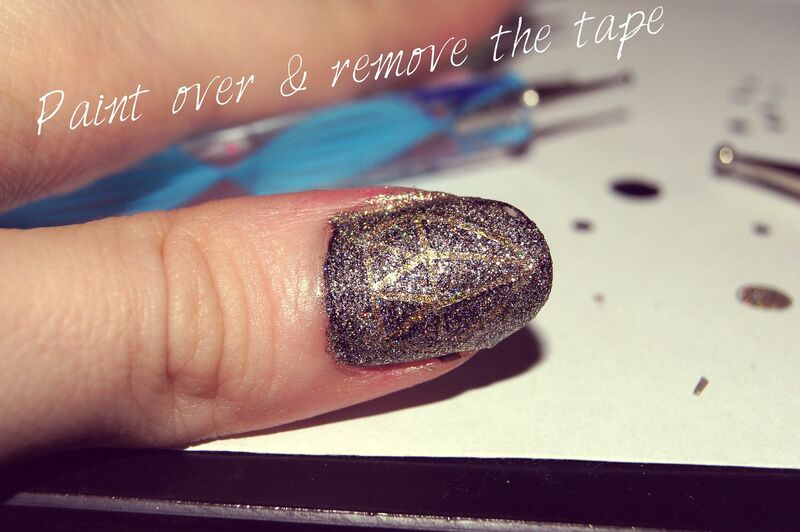 Paint over the whole thumb with gold polish, and let dry before removing the striping tapes. Be gentle when pulling the tape off, so that it won't ruin the design. Now you just have to add your top coat (I used Essie Good To Go) and clean up possible mess, and you're done. 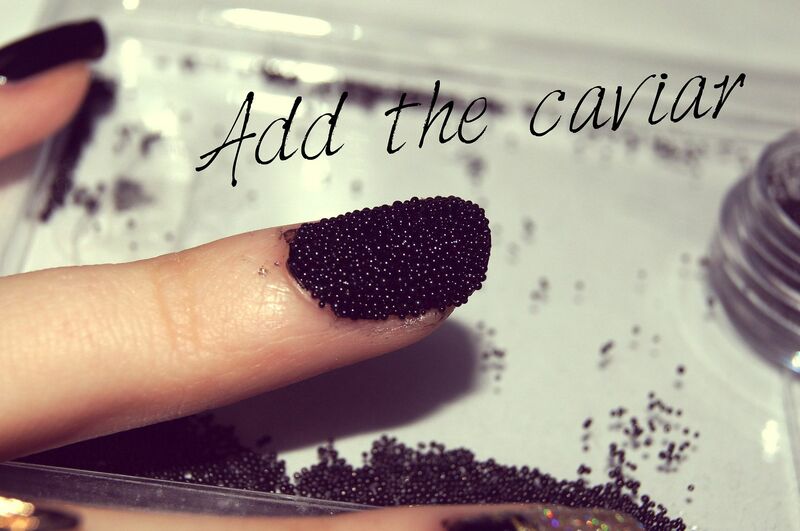 The caviar part doesn't necessarily need a top coat, because many of the beads tend to lose their color when the top coat is added. Also, my tip for clean up is to use a small brush dipped in nail polish remover. 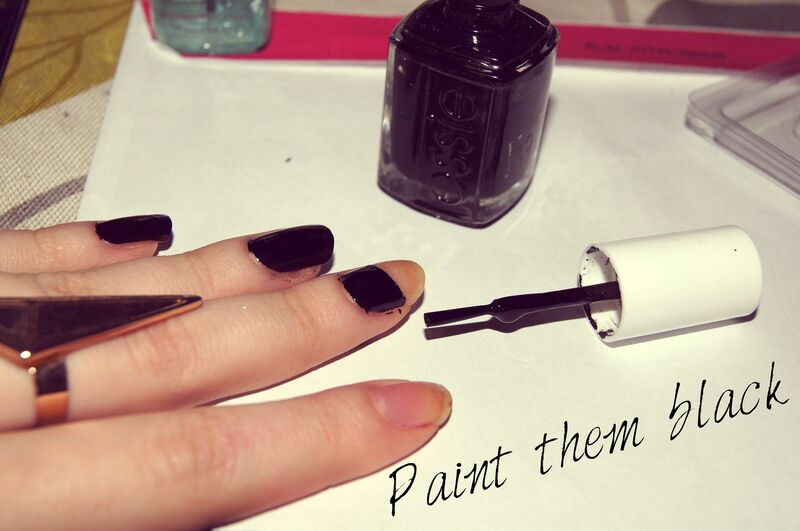 Gently brush along the sides of your nails, and the nails should end up looking neat. I also recommend adding a little moisturizing after the clean up, so that your cuticles won't end up dry and painful. Please let me think how do you like this tutorial/nail design! Let me also know what kind of nail tutorials you'd like to see in the future so I will try to keep your requests in mind when painting my nails. I hope you'll all have a fabulous week! your nails turned out amazing!! WONDERFUL nails and tutorial dear!! 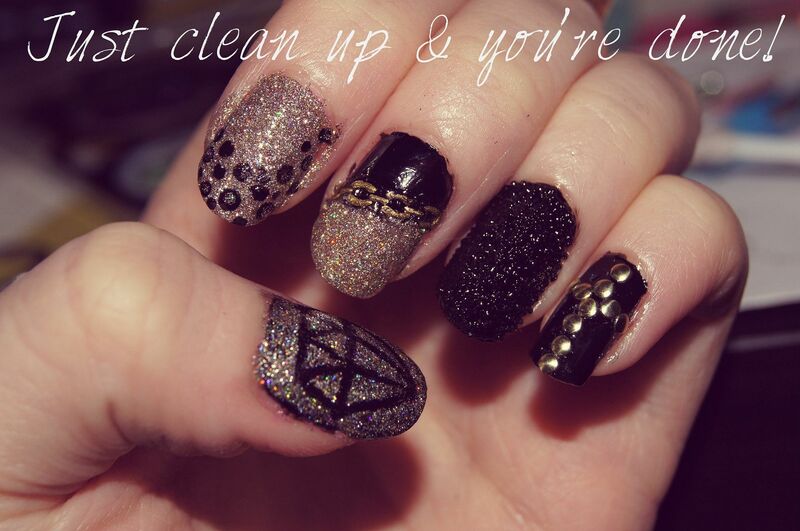 I wish I had the time and patience to do this too on my nails, they look amazing! Whoa that is too cool. You're so good at this! Black and gold is a perfect combination. Love that you made for each nail an another design, this way it looks very unique! I'm so impressed! Your nails came out so incredible. They look so professionally done! Absolutely love how they came out. 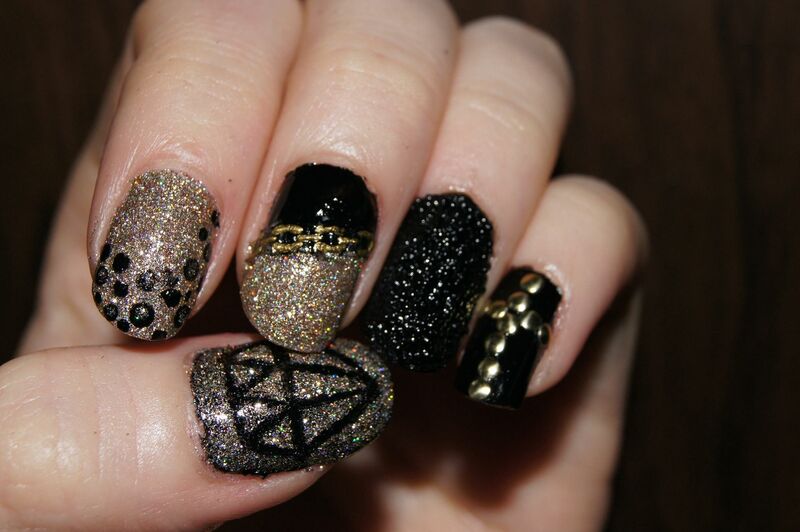 Absolutely adore these nails, love black and gold combo! Johanna! That is so wicked good girl! I love it! You're so talented. I'm a big fan of the colors black & gold. Great job!